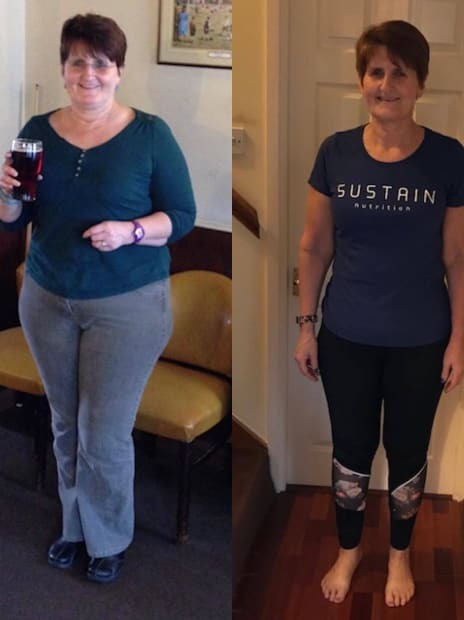 "I have gained: A love for exercise Increased self confidence as I actually don’t mind what I see in the mirror now A new and growing group of friends with my fellow Sustainers A smaller bank balance as I can’t seem to stop buying clothes"
‘I first came across Sustain Nutrition in the spring of 2016. A colleague at work had achieved amazing results following the programme. I had the option to do a free trial and turned it down as I just couldn’t get my head round how I could make it work as a vegetarian with the need to have protein with each meal – how wrong could I have been!! I thought I could lose weight myself by applying my own “healthy” eating ideas. Not sure why as I had never had lasting success before. I lurked around the Facebook page and made the most important and life changing decision of my adult life to start my Sustain journey on 1 January 2017. James has been my coach from the beginning. I cannot thank him enough for all his support, encouragement, guidance, gentle abuse (banter) and friendship.